From the award winning snowboard video DVD producers at Teton Gravity Research (TGR), in partnership with Jeremy Jones, comes the most progressive big mountain snowboarding film to date, DEEPER. Follow Jeremy and other top freeriders as they travel to the worlds snowboarding meccas and venture past the boundaries of helicopters, snowmobiles, and lifts to explore an untouched realm. Hang on tight as Jeremy Jones faces the biggest challenges he has ever encountered in snowboarding. All night hikes, sleeping on peaks, camping 65 miles from civilization, 20 below temperatures, 10 day storms, and 20 mile days bring the adventure back into riding. The Deeper snowboard video DVD puts the viewer in the athletes boots; from the trials to the tribulations, to mind-boggling breakthroughs in the sport of snowboarding. From the award winning snowboard video producers at Teton Gravity Research (TGR), in partnership with Jeremy Jones, comes the most progressive big mountain snowboarding film to date, DEEPER. Follow Jeremy and other top freeriders as they travel to the worlds snowboarding meccas and venture past the boundaries of helicopters, snowmobiles, and lifts to explore an untouched realm. Hang on tight as Jeremy Jones faces the biggest challenges he has ever encountered in snowboarding. All night hikes, sleeping on peaks, camping 65 miles from civilization, 20 below temperatures, 10 day storms, and 20 mile days bring the adventure back into riding. The Deeper snowboard Blu Ray video puts the viewer in the athletes boots; from the trials to the tribulations, to mind-boggling breakthroughs in the sport of snowboarding. Right Brain left Brain DVD by Think Thank... Think Thank goes straight to the dome with "Right Brain Left Brain" snowboard video DVD. Meticulously messy, precisely unpredictable and controlled chaos; snowboarding is everything and can do anything. Such a lofty pursuit takes both halves of one's brain. Think Thank is taking the time this season to pull our brains apart, examine the differences and then put them back stronger than ever. Creative control concisely conjured for cuticle carousing co-opting corrosive comatose inducing creatures. Thanks again brain! Veeco Productions is proud to present 9191, a sideways snowboard DVD video introspective into the bewildering snow-covered dreamscape of international time traveler and mystic of the shred - Gigi Rüf. Every year, Gigi circles the stratosphere in the name of snowboarding and 9191 is the accumulation of his visions from a season, documented in 16mm film, super 8, and highly defined video. 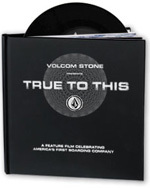 Original soundtrack produced and composed by Baron (Extremely Sorry), exclusively for Volcom Entertainment. Hold onto your schnitzel and Viel spass! 9191 was filmed around the globe in New Zealand, Austria, Switzerland, Jackson Hole, Chile and Alaska. Throughout the film, Gigi was joined by friends and teammates: Wille Yli-Luoma, Bryan Iguchi, Luke Mitrani, Curtis Ciszek, Blair Habenicht, Nicolas Muller, Jake Blauvelt, Wolle Nyvelt and others. Transworld Snowboardings new snowboard DVD video, In Color, documents an action- packed winter with a diverse crew of snowboardings most talented riders. From the Canadian backcountry to the streets of the east coast to Scandinavian park sessions, the riding is heavy. Legends like Devun Walsh and Jussi Oksanen back up young chargers like Keegan Valaika and Mikkel Bang. Jake Olson- Elm and Phil Jacques heat up the streets; and the list goes on. Filmed in stunning HD digital video in Alaska, Norway, Whistler, Minnesota, California, Quebec, Calgary, and beyond. In Color paints a vivid picture of the current state of snowboarding. Last year, Shaun White disappeared from the snowboard scene, holing up in the wilds of Colorado training for what would be the biggest winter of his life. This snowboard DVD video is the story of his year, the private halfpipe and one of the most progressive sessions in history. A creative dozen of snowboardings most dynamic riders come together for CHEERS, the new snowboard video DVD by People Creative. The same crew who brought you last years Nice Try team up with legends like JP Walker and Jeremy Jones alongside young wizards like Joe Sexton and Zac Marben. CHEERS bridges the gap between pedigree and potentialwith a variety of talent, terrain, and locations to make this the best People movie yet. Filmed in crispy HD digital video with a wicked soundtrack, CHEERS takes viewers up-close and on-location to Lake Tahoe, Finland, Sweden, Whistler, Revelstoke, Washington, Utah, Oregon, Minnesota, and Newfoundland for a full season of good times and great snowboarding. Riders: JP Walker, Zac Marben, Jeremy Jones, Joe Sexton, Mikey Rencz, Simon Chamberlain, Aaron Biittner, Shaun Mckay, Eero Niemela, Seth Huot, Curtis Ciszek, Lauri Heiskari. Role Model Production's new snowboard video movie, Think Positive. The producers of this snowboard video dvd have brought together old friends, fresh faces, big-timers, poor snow-shreds, stressed out filmers, photographs, and the most loyal companies around to show snowboarding through their eyes. An amalgam of filmers, riders, and others from some of your favorite former snowboard videos, like Hardwire, Neoproto, Animatic Inc, and others. You may recognize some of us, others might be new names, but I promise you will enjoy our snowboarding. List of Athletes: Tim Eddy, Casey Neefus, Brendan Hayes, Zac Marben, Nima Jalali, Greg Hahn, Pat Lynch, Jake Devine, Jonas Michilot, Scott Stevens, Erich Dummer, Trevor Cain, and others.. In their third year, Whiteout is happy to present you with the riding and filming from another snow season in Whistler, British Columbia, and abroad. Their new snowboard video dvd release this year is entitled Wear It Well, and will promise to deliver the same quality rider-owned-and-operated, filming, riding, and editing that Whiteout has delivered in their previous releases. Riders: Jesse Fox, Tadashi Fuse, TJ Schneider, Eero Niemela, Mikey Renez, Trevor Andrew, Benji Ritchie, Chris Brown, Kale Stephens, Alex Auchu, Paavo Tikkanen, Jaakko Seppala, JF Pelchat, Matt Dano, Reno B, Shin Campos and Rube Goldberg. Length: 30 mins! TB9 snowboarding video features some of the best snowboarders in the world on the most extreme and diverse terrain. The Blaring soundtrack, death defying-lines, and technical freestyle tricks will keep you pushing rewind - TB9 is the must-see snowboard video of this year, without question! Kevin Jones - has a huge segment!, Jussi Osksanen, the up and coming Finnish super ripper, Johan Olofsson - rips every possible big mountain jib from Canada to Alaska, Jeremy Jones - shot all season with Standard to put together one of the best big mountain segment's ever captured on film. Plus - Brian Savard taking care of business in B.C., New hard charger Jason Mcalister, Chris Engelsman, Bobby Meeks, Marcus Egge and Shaun White getting better every year! TB8 infinity is the super cool release from Standard Films. Slam packed with cutting freestyle, big slams and the best riders in the world going off. The big mountain riding is worldclass, setting the standard for a decade now. The sound track kicks with a well rounded mix as well. "Action from the record setting year of 1998 for snow, this video is packed full of huge riding in Alaska, Dave Barlia's 3000 foot cliff drop in Norway is sick!. Plenty of big back country kickers, powder runs and cutting edge freestyle. This video delivers." "Be prepared for first descents in Alaska, complete with unruly sluff slides engulfing riders, huge airs and major crashes.Pacific Northwest, Europe, Jackson Hole and other insane locations!" Featuring: Jason Borgstede, Robbie Sell, Gian Simmen, Xaver Hoffmann, Luke Wynen, Gabe Taylor, James Ledford, Tom Flocco, Max Henault, Marc Andre Tart, Chris Coulter, Cooper Hoffmeister, Kendall Whelpton and many, many others. Locations: Shot on location in Switzerland, Germany, Austria, Canada, USA and Japan. Packed with rails, backcountry kickers, park, pipe and big mountain lines, DFS Productions thrusts freestyle riding to higher levels in Declaration. Featuring the most progressive riding caught on striking 16mm film, Declaration is one video that will be watched over and over again. Filmed in the far corners of the world, and complete with killer soundtrack, Declaration is a mind-blowing snowboard video. Riders Ed 1: Cover the basics and fundamentals. Learning to turn, Equipment, basic tricks, how to fall and more! Riders Ed 2: A pacemaking collection of new tricks technically delivered by the next snowboarding generation. Visually crafted on beat to the latest bumpin' sounds. Real-time actions, fast cut and slick graphics. A video you don't want to miss. Learn from the best with this instructional trick snowboard video dvd. TransWorld Snowboarding presents 20 Tricks. An Instructional snowboard dvd shot on location at Bear Mountain, CA; Park City, UT; and Brekenridge, CO. Riders: Jussi Oksansen, JP Walker, Leanne Pelosi, Nima Jalali, Nate Bozung, Darrell Mathes, Chris Bradshaw, Ero Ettala, Heikki Sorsa, Hampus Mosseson, Tim Eddy, Scotty Arnold, Bryan Fox, Jordan Mendenhall, Aaron Biitner, Jeremy Jones, Alexis Waite, Jamie Anderson, Chad Otterstrom, Steve Fisher, Chas Guldemond and Ryan Thompson. Time to step up your riding with round two of Transworld SNOWboardings 20 Tricks instruction snowboard video20 Tricks Volume II. Based on the same model as the first release, 20 Tricks Volume II highlights moves for every abilityfrom a method clinic with kicker-killer Pat Moore to the proper execution of Cab nosepresses to backside 180 out courtesy of Simon Chamberlain. Its as easy as watching the maneuver go down and listening to the pros explain it step by step (divulging all sorts of secret tips and insider advice in the process). So you always wanted to learn one-footer airs? Josh Dirksen will show you how. Or maybe youre ready to start chucking frontside 900s? Not to worryJP Walkers got you covered. 20 Tricks Volume II showcases terrain, personalities, and tricks from the slopes of Big Bear, Park City, and Breckenridge. Turning up the heat has never been easier. TransWorlds 20 Tricks Volume 3 instructional snowboard DVD: Progression Sessions teams up with the worlds best pro snowboarders to help you progress your riding from the basics of a trick to advanced. All the tricks you want to learn are here in easy-to-follow echo sequencesyou wont miss a move with this new format. Youll learn 10 basic tricks followed by 10 advanced variations. Start with a switch boardslide and then step it up to a half Cab to 5-0 to180 out. This new format accelerates your progressionjust follow alongwith moves this tight, you might just get sponsored. (Free 20 Tricks pocket guide insidetake it on-hill!) 20 Tricks. (Instructional) The rider list includes some of the premiere competitors, urban and backcountry talent in the game, including the likes of Torstein Horgmo, Lonnie Kauk, Stevie Bell, Justin Bennee, Chas Guldemond, Eero Niemela, Dan Brisse, Bjorn Leines, Luke Mitrani, Marko Grilc, Sebastien Toutant, Shayne Pospisil, Greg Bretz, Louie Vito, Jake Welch, Heikki Sorsa, Darrell Mathes, Jake Olsen-Elm, Louif Paradis, Nick Dirks, JJ Thomas, Jack Mitrani, LNP, Eiki Helgason and many more. Theyll be breaking down and teaching you both signature and set-up tricks on a wide variety of jumps, rails, pipes and creative jibs, all played host by Keystone, Winter Park, Northstar-at-Tahoe and Sierra-at-Tahoe. How, is a 16mm progressive freestyle instructional snowboard video featuring the riding of Iikka Backstrom, Eddie Wall, Joni Malmi, Lauri Heiskari, Simon Chamberlain, Andreas Wiig, Eero Niemela, Mikey Rencz, Alex Auchu, Travis Kennedy, Kurt Wastell, Chris Coulter and Chad Otterstrom. Egan Entertainment brings a well made skiing and snowboarding instructional dvd video. Includes tips and tactics for steeps, powder, bumps, trees, and the terrain park. Remastered and now on DVD, this 1993 classic snowboard video invites a young man named Terje Haakonsen to come out and play. Also includes Craig Kelly, Jeff Brushie and Dieter Happ.